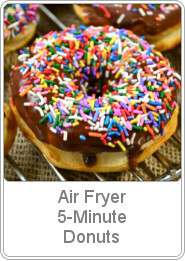 5 Minute Air Fryer Donuts – A simple recipe for a favorite treat that can be made in just 5 minutes. These are a healthier version than their oily counterparts and can be topped with your favorite topping. Deliciously simple! I went to a health seminar a few years ago and one of the things that has stuck with me was a visualization of how much fat was in just one doughnut. The speaker, Zonya Foco, reached into a container of vegetable shortening and pulled out a hand full of fat. It was one of the most disgusting things I’ve seen and it has stuck with me ever since. I have not eaten a doughnut since then, that is until I got my air fryer. Now I make them myself, with less fat and I don’t have to feel guilty indulging in toppings that are filled with sugar, which is actually the best part. What would be your favorite way to top these donuts? Refrigerator Biscuits: The best biscuits to use for this recipe are flakey biscuits, non-flakey biscuits tend to be heavy. Also you will want to use the jumbo sized biscuits, they create the perfect size doughnut. Coconut Oil: You don’t have to use coconut oil, I just like using a healthier option. However, you do need to use a little oil and it should be one with a high smoke point, like canola, vegetable or corn oil. Step 1: Open the package of biscuits, separate and place on a flat surface. Using a 1-inch biscuit cutter, cut out the middle of the biscuit. Set the doughnut holes aside. Step 2: Lightly grease the inside of the air fryer basket with coconut oil. Step 3: Place as many of the donuts that will fit, without touching into the air fryer basket. Step 4: Set the air fryer to 350°F for 4-5 minutes. Let cook for 3 minutes, then turn them over and continue cooking until they are a light golden brown. Step 5: While the donuts are cooking, melt the butter and prepare the toppings that you’ll be using. Step 6: As soon as you remove the donuts from the air fryer brush them with the melted butter and cover them in your favorite topping. Powdered Sugar – roll the doughnut that has been brushed with melted butter in a bowl of powdered sugar. Cinnamon Sugar – roll the doughnut that has been brushed with melted butter in a mixture of 1/2 cup granulated sugar and 1 1/2 teaspoons of ground cinnamon. Glaze – place donuts on a cooling rack, drizzle with a mixture of 1 cup powdered sugar, 2-3 tablespoons milk and a 1/2 teaspoon of vanilla. Let sit for a few minutes before serving. Chocolate Frosting – in a small bowl whisk together, 2 tablespoons melted butter, 2-3 tablespoons milk, 1 tablespoon corn syrup, 1 cup powdered sugar and a 1/4 cup of melted chocolate chips, mix until smooth. Dip your freshly cooked donuts into the chocolate frosting and place on a wire rack to cool. 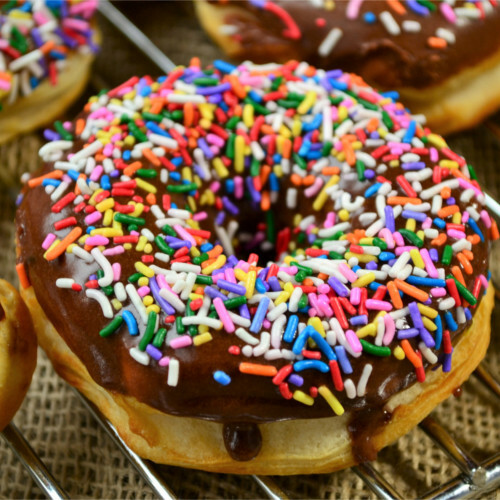 Chocolate can be reheated and stirred if it sets up before all of your donuts are coated. 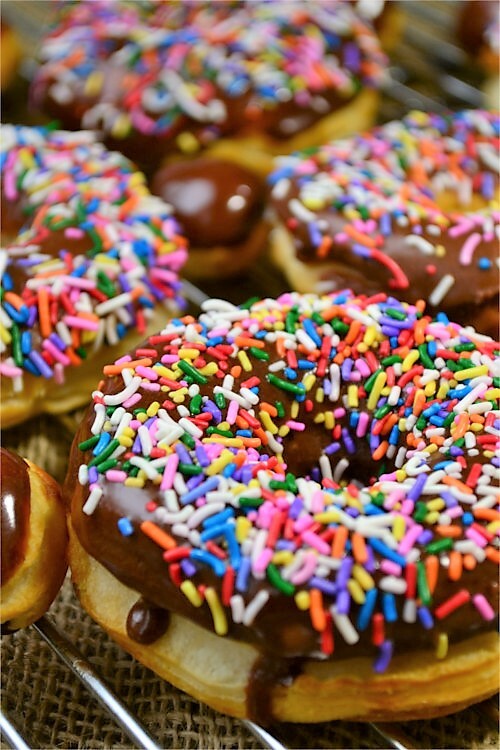 Sprinkles – dip donut in chocolate frosting and immediately sprinkle with brightly colored sprinkles. This is my favorite way to eat donuts :)!!! 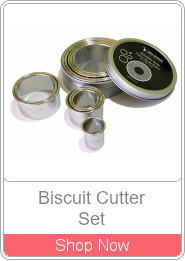 Separate biscuits, cut a 1-inch hole in the middle using a biscuit cutter. Lightly grease the air fryer basket with the coconut oil. Place donuts into the air fryer basket, making sure that they don't touch. Set the air fryer to 350°F for 4-5 minutes. Cook for 3 minutes, turn over, continue cooking until golden brown. Melt the butter and prepare the toppings. Remove brush with melted butter and cover with your favorite topping. Powdered Sugar - roll the doughnut that has been brushed with melted butter in a bowl of powdered sugar. Cinnamon Sugar - roll the doughnut that has been brushed with melted butter in a mixture of ½ cup granulated sugar and 1½ teaspoons of ground cinnamon. Glazed - place donuts on a cooling rack, drizzle with a mixture of 1 cup powdered sugar, 2-3 tablespoons milk and a ½ teaspoon of vanilla. Let sit for a few minutes before serving. Chocolate Frosting - in a small bowl whisk together, 2 tablespoons melted butter, 2-3 tablespoons milk, 1 tablespoon corn syrup, 1 cup powdered sugar and a ¼ cup of melted chocolate chips, mix until smooth. Dip your freshly cooked donuts into the chocolate frosting and place on a wire rack to cool. Chocolate can be reheated and stirred if it sets up before all of your donuts are coated. 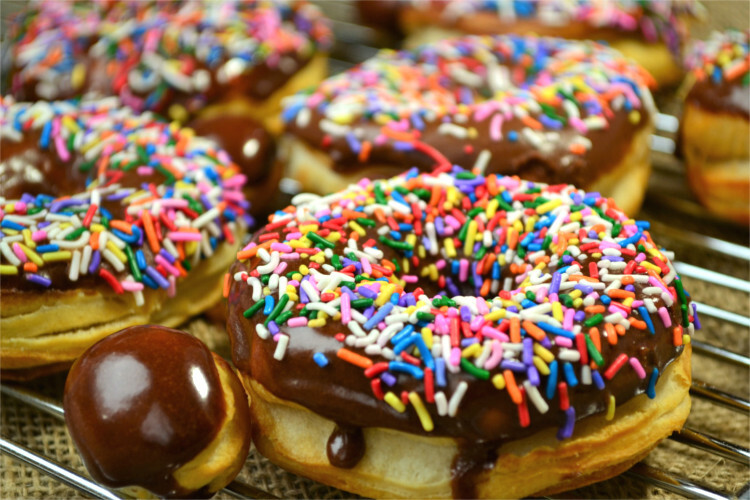 Sprinkled - dip donut in chocolate frosting and immediately sprinkle with brightly colored sprinkles. ✔ If you don’t have a biscuit cutter try using the lid from a soda bottle or a shot glass, both work great. ✔ For the doughnut holes, cook at 350°F for 3-4 minutes, giving them a toss after 2 minutes of cooking. Wow! 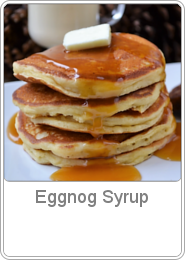 These look yummy and easy. If only I had an air fryer. I didn’t realize that was a thing! 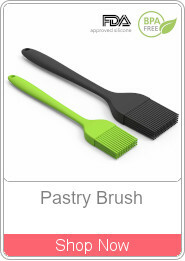 When I received one as a gift, I wasn’t sure if I was going to like it, now it’s one of my favorites, I use it all of the time. Ohhh, this is so easy! My boys are going to love these for sure!! Thanks for sharing! These look delicious! We just got an air fryer and have only tried making French fries so far but we just loved them. I’m going to pin this for us to try. You had me at “5 minutes.” 😉 I still haven’t gotten an air fryer but this may have pushed me over the edge. ha ha ha Pinning and printing. Thanks for sharing! My mouth is watering as I type! Your doughnuts look so wonderful, and I love that there is little fat in them. I guess that means I could eat a few in one sitting?? Thanks so much for sharing these here today at Fiesta Friday! I love that I can indulge in donuts and not have to worry so much about the fat! Yep, I need an air fryer just for this recipe – YUM!! Totally worth the investment for this recipe alone! I can’t get over how quick and easy these are to make, Robin, and they look so good! I think I need an air fryer now…Thank you for sharing, and for being a part of the Hearth and Soul Link Party. I hope you have a lovely weekend! They are super easy to make, even the kids can make them! These look so good! I haven’t had a donut in forever! Thanks for sharing with us at The Blogger’s Pit Stop! I gave up on them too, when I heard how much fat just one doughnut has in it. The nice thing about this is that you don’t have to worry as much about the fat. Ok, now I want an air fryer! And doughnuts! Lots of doughnuts! You have to get one! I wasn’t sure if I was gonna like it, but with some experimenting I’m lovin’ it! I haven’t tried air fryer donuts and now I am very curious about the taste. Thanks for sharing at Fiesta Friday party. Congratulations! Your post was my feature pick at #ThursdayFavoriteThings this week. Visit me at Marilyns Treats on thursday morning to see your feature! All hosts choose their own features from the comments left on their blog so be sure to return to my blog to see your feature. I invite you to leave more links to be shared and commented upon. Please don’t forget to add your link numbers or post title so we can be sure to visit! If the arm is removable, then I would definitely remove it for this recipe. A refrigerator biscuit is just a flour based dough, that is baked and served with dinner. They are similar to a dinner roll but more dense. 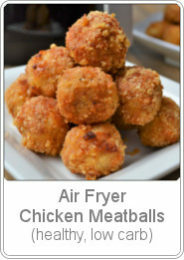 These look amazing, I think I need an air fryer! Thanks for joining us at #KCACOLS hope you to see you there again soon. We have literally just bought an air fryer this weekend! I had no idea you could make donuts in them, this makes me happy.